“Bosso” is short for Bosso Poetry Company, a collective of poets and musicians founded over twenty years ago by Kevin Brixius (1956-2015). 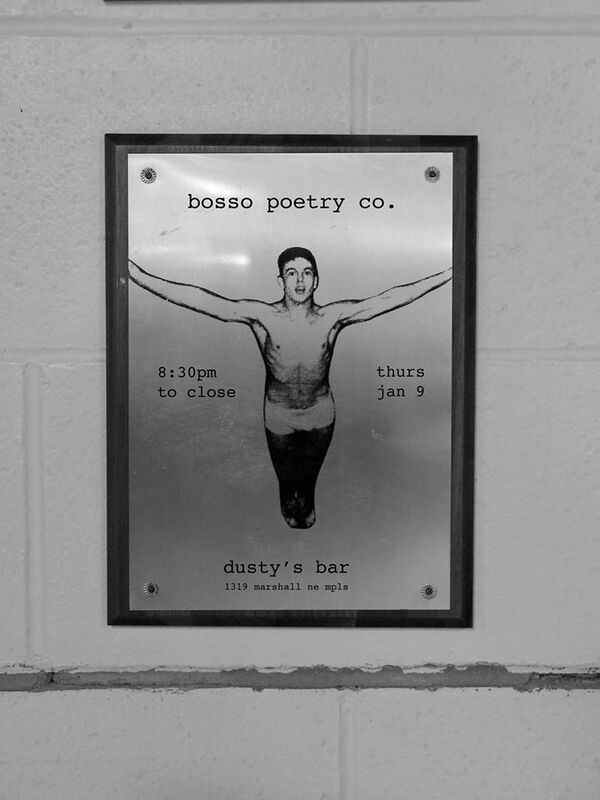 Since November 2008, Bosso has had monthly shows at Dusty’s Bar in NE Minneapolis, MN. In order to get the word out, especially online, as a Bosso regular/organizer, I create a promo poster for most upcoming performances. I also take photographs and video while at the shows , documenting some of the performers. What follows is a combination of all these things. For more current information about upcoming Bosso performances please visit Bosso Poetry Company here. Bosso Poetry Co. Moving Images Part 1--"Poem 800"
Bosso Poetry Co. Moving Images Part 2-- "I was a bird"
Bosso Poetry Co. Moving Images Part 3--"Let It Flow"
Bosso Poetry Co. Moving Images Part 4--"Three Amp Engine"